As domestic production continues to increase, the average density of crude oil produced in the United States continues to become lighter. The average API gravity—a measure of a crude oil's density where higher numbers mean lower density—of U.S. crude oil increased in 2017 and through the first six months of 2018. Crude oil production with an API gravity greater than 40 degrees grew by 310,000 barrels per day (b/d) to more than 4.6 million b/d in 2017. This increase represents 53% of total Lower 48 production in 2017, an increase from 50% in 2015, the earliest year for which EIA has oil production data by API gravity. Along with sulfur content, API gravity determines the type of processing needed to refine crude oil into fuel and other petroleum products, all of which factor into refineries' profits. Overall U.S. refining capacity is geared toward a diverse range of crude oil inputs, so it can be uneconomic to run some refineries solely on light crude oil. Conversely, it is impossible to run some refineries on heavy crude oil without producing significant quantities of low-valued heavy products such as residual fuel. Oil produced in North Dakota's Bakken formation also tends to be less dense and lighter. About 90% of North Dakota's 2017 crude oil production had an API gravity of 40 to 50 degrees. The oil coming from the Federal Gulf of Mexico (GOM) tends to be more dense and heavier. 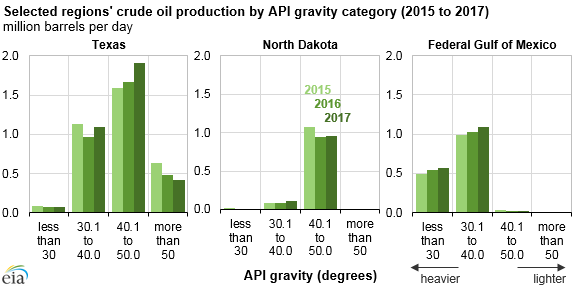 More than 34% of the crude oil produced in the GOM in 2017 had an API gravity of lower than 30 degrees and 65% had an API gravity of 30 to 40 degrees. EIA collects API gravity production data by state in the monthly crude oil and natural gas production report as well as crude oil quality by company level imports to better inform analysis of refinery inputs and utilization, crude oil trade, and regional crude oil pricing. API gravity is also projected to continue changing: EIA's Annual Energy Outlook 2018 Reference case projects that U.S. oil production from tight formations will continue to increase in the coming decades.